The most difficult aspect of Forged to Fight is not the bosses, forming alliances, completing missions, defending your base or collecting bots. No, the MOST difficult and frustrating part of this game is collecting a decent star rating of YOUR favorite bot. If there's a favorite bot you still don't have, I probably have it.... and more than likely, you have had my 3* IronHide for weeks now. Just the way it goes. So this is MY documented journey into the abyss of this impossible goal. How long will it take ME to obtain a Duplicate 3* IronHide? Especially considering I play at least an hour every day and plan to spend exactly $0.00 to get him? I predict I will NOT get him by Christmas of this year 2017. 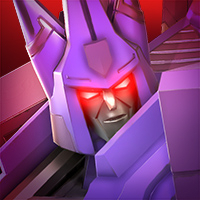 As of today, I've been an active player for over 80 days, reached level 32, own FOURTEEN 3-Star Bots, and have submitted an application to The Guinness Book of World Records for the "Longest Duration Without a 3-Star IronHide on Transformers: Forged to Fight". This is my journey... my struggle... my shared experience. "3* IronHide or Bust!" So here we go! "The personal attacks in here are throwing the thread off topic and have gotten out of hand, so we're closing this now. As a reminder, the forum rules are here. If you don't agree with a thread, you can simply not post on it. Disagreements and debates are fine, but it's not OK when you make it personal." So to the handful of haters and trolls... you've been warned and are on notice. Day 80: Out of 13 Crystals saved for the week, I actually opened up a new and different 3-Star Bot! But was it THE ONE? Welcome back! Was it ... THE ONE??? $10 says nope! Keep at it man! I had given up hope on getting Prowl, but the PBCs I got for clearing the last Spotlight chapter had one! Just got my 2* Starscream from raids as well (forget that 3* offer, maybe Mustangjon or Nergury could do it) so I'm back to a full collection. To all the haters and trolls, why can't we all just get along and encourage this guy in the pursuit of his fave bot? Bay Ironhide actually was kinda cool, right up there with Jazz. 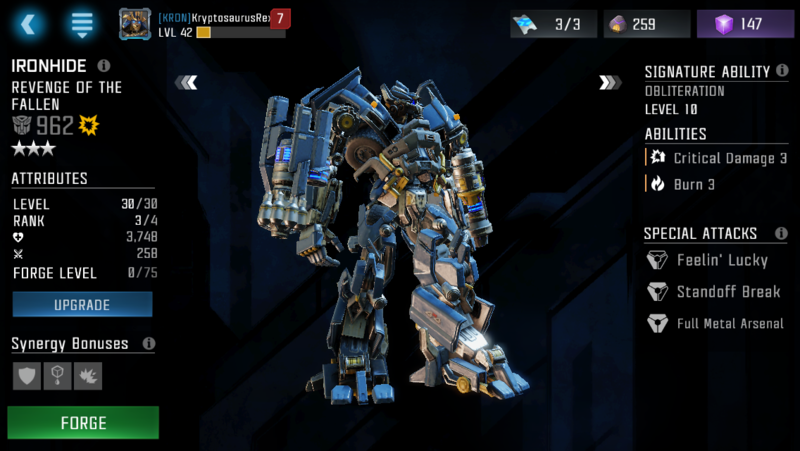 My elusive 3* bot is Motormaster, I own all the rest of the bots heck I have a 4* Motormaster but still no 3*. I've been playing since launch. Are you only opening PBCs to try and get your IH? forge those 2* bots and open 3* crystals man... You'll get him quick. Day 86: 13 new crystals opened this week... anyone else would have success with that many crystals... but as for me?! I own a 3* MotorMaster... but If I owned a 4* IronHide, this thread would be shut down immediately... by yours truly. Yes, I'm opening up PBC's and FDC's as well as the occasional 3-Star Bot Crystals... I even forge EVERY 2-Star bot I already have as 3-Stars... so yeah I'm keeping my Maxed out 2-Star Duped IronHide because without him, this game would be worthless. Oh and I could own 10 3-Star Crystals... wouldn't matter, IronHide wouldn't be any of them for me. As I've said before, other forum members and now even my own alliance members are opening him using PBC's... so why can't I? 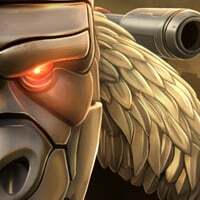 On a tangent, does anyone know if Kabam has a listing or announcement of which upcoming 3* bots they intend to give away on the monthly calendar or raid calendar schedule? It might be Starscream next month. @AGBandit question: why do you call it a "gambit"? All the best in your duped 3* ironhide. I'm waiting for my duped 4* OG prime too. Already duped ironhide 4* once prior to this. Hoping to get rachet 4* on my next 4* crystal as that would really make me jump =o.. More than a 4* duped OG prime. Been using 3* max forged rachet for a long time in AM zz. Is what makes the game interesting. Imagine if everything is given to you so easily.. Most ppl would have quit much sooner. Day 93: A new record week of 23 crystals to open... Highlights include my 15th & 16th brand new 3* Bots... and MY FIRST EVER 4* BOT.... but was it THE ONE?! I was wondering when someone was going to question why the use of "Gambit" in the title... according to Merriam-Webster's dictionary: 2a. a remark intended to start a conversation or make a telling point. 2b. a calculated move. So basically, I'm using IronHide as my remark intended to start a conversation or make a telling point about an injustice that is impossible to overcome. Also, I've done nothing BUT calculated moves in order to obtain IronHide. And finally, the title is a nod to the original Transformers Cartoon Season 2, Episode 23 "The God Gambit". Grimlock, Starscream... well since next month's bot is all speculation, I guess there's still hope yet that it could be IronHide... but I'm not holding my breath. The Guinness Book of World Records has replied to my request that they would be willing to review my case should I reach the 100 day mark upon confirmation of proof. So a week from today is going to be a special record breaking occasion! Ok wait... So you have a 3* IH already and you need to just get a dupe, or you haven't pulled one at all yet? I've done nothing BUT calculated moves in order to obtain IronHide. If this were true you would be more active in game and join an alliance that can actually finish the weekly and daily events. You're missing out on heaps of 3* shards and would have had your desired 3* several times over by now. Very minimal effort is being put in to this goal. It's like saying you want six pack abs but still eat mcdondalds every day and don't exercise and then do a daily weigh in. 'Have I lost weight today? let's check!'. This would be interesting if it were a real gambit with some active effort. I also dislike clickbait 'but was it THE ONE?!' type comments. You could simply say it. Why force people to click a video link. Maybe starting a blog would be a better idea to document your story, as this is a diary of sorts. The pessimistic and defeatest attitude saying things like "IronHide wouldn't be any of them for me." and "other forum members and now even my own alliance members are opening him using PBC's... so why can't I"
The answer is you simply need to play the game more. Something that would make this thread exciting is saying what you've done and what you're doing to actively really work for it. If you want it for free, expand on your efforts and make it interesting. Also, a lot of your crystals are just dailies.. the chance for a 3* is super low and shouldn't even be considered when counting things, including them just makes your number sound bigger, it's not realistic. Also, I'm watching your video for the first time, and wow, the way you talk is very negative. It was depressing to watch. You get amazing gameplay bots like Soundwave and call it crap. You get your first 4* and you're not excited or happy at all in the video. You're indignant when you talk about the 'high' number of crystals and say things to the effect like you're owed something. 23 is not a lot, especially when adding in all your dailies heavily padding the crystal count. If you wanted to make real effort, instead of relying on 1* daily crystals, you actually have a decent roster to level up to get into an alliance that completes event milestones. Those milestones will give you heaps of shards for crystals that have a real chance at IH. I'm quite sure there's heaps of people on here who would be happy to have you in their alliance.. there might even be some that are willing to carry you and don't mind if you're not active enough compared to others, just to help you with your goal. Let's put the call out, who can help carry AGBandit in their alliance? Who has a free spot? It's actually kinda funny listening to these videos, every time you don't get IH your sound of disappointment makes me think of Napoleon Dynamite. exactly @Terminal ... he's not playing the game enough, and from the looks of it more like a casual player on and off on the game. 3*s are easily to collect.. if you often ranked in 3* Arena, participate in Alliance missions (in a good alliance), play spotlight missions when they're on you would easily accumulate a lot of 3* shards in no time. 4* shards on the other hand is wayy more scarce, rare, and harder to obtain! Grind out that 3*, spend some of your energon and get er done! players like me have quit 3* arena so more chance for you guys. So busy grinding.... no time to properly respond or thank you guys! If he pulls 3* from arena, will we have to watch this thread for another 6 months as he tries to dupe it? There will be two IH arenas, no? He could get it duped if he works hard enough.. Or is the 2nd arena only for new bots? I can't remember.